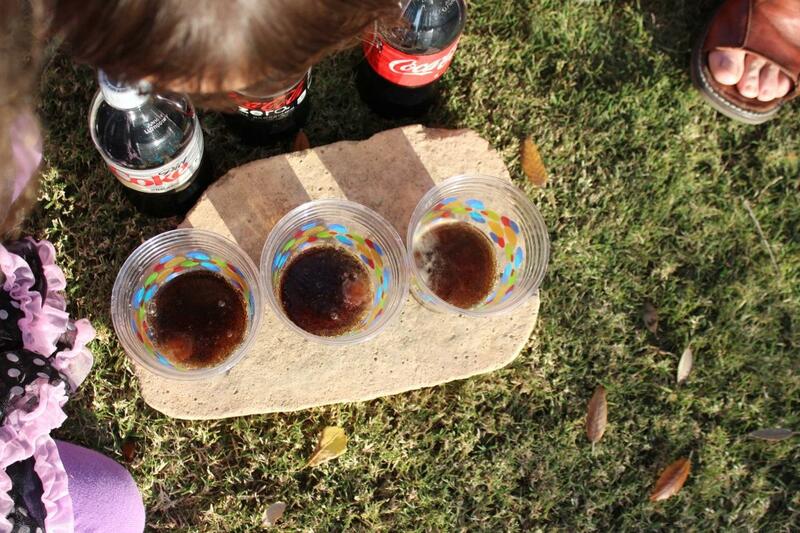 Last weekend we decided to go back with the girls and continue our fizzy experiments. We bought the wrong kind of Mentos last time and never got the geyser that we were expecting (specifically: the fountains of the Bellagio with Coke and Mentos). Chewing gum Mentos did not do the trick. 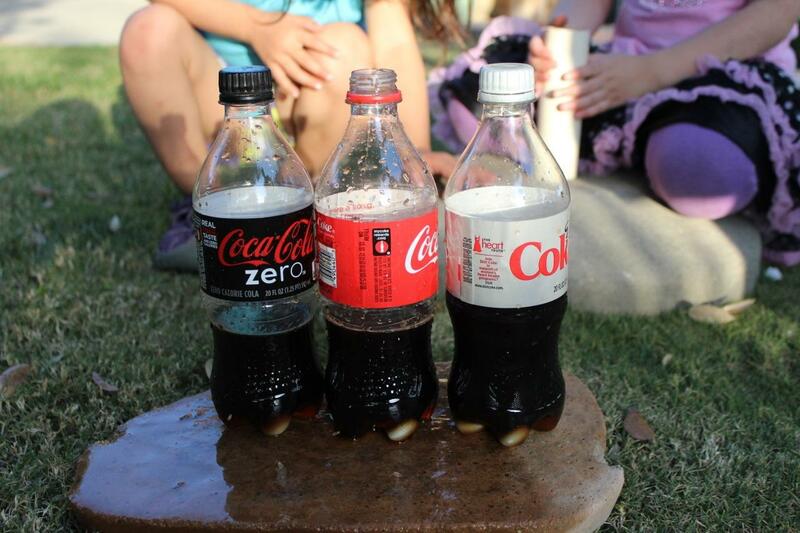 This time we decided to take a different approach and see if different types of Coke and Mentos had different reactions. We got 2 liter containers of Diet Coke, 3 20 oz. containers of Regular Coke, Coke zero and Diet coke, then we got a smaller version of the Diet coke. And we also bought mint and fruity Mentos. 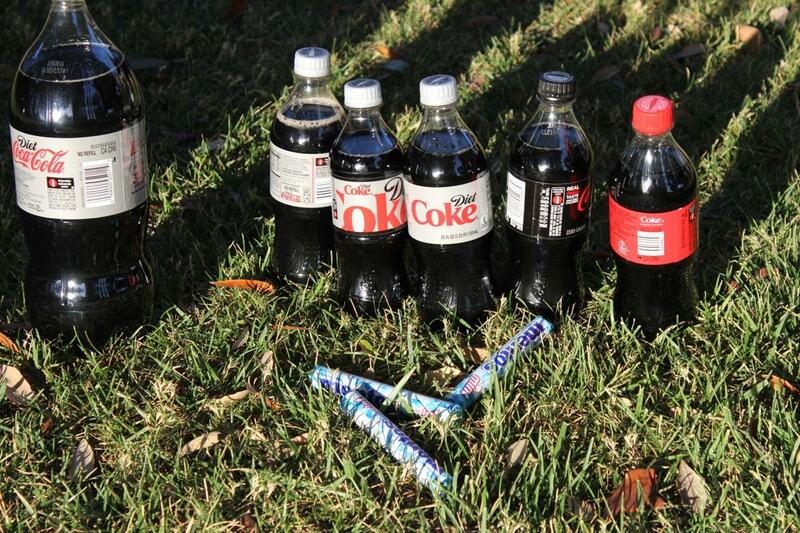 The most reactive was Coke Zero, but Regular Coke took the longest to stop fizzing. You can see on the last picture that the girls were very curious about the SMELL of the reaction… even though there really wasn’t one. The geyser shot about 6 feet up. The reaction was so big I couldn’t get the top part of the geyser on camera… I wasn’t fast enough! 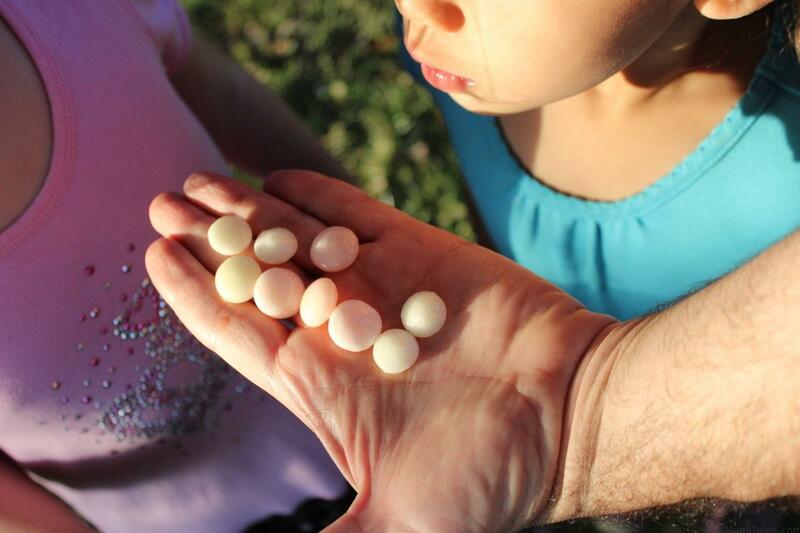 We got their attention back when we rescued the spent Mentos from the bottles, and asked what would happen with the used Mentos (fruit and mint combined) if used in a fresh bottle of Diet Coke. 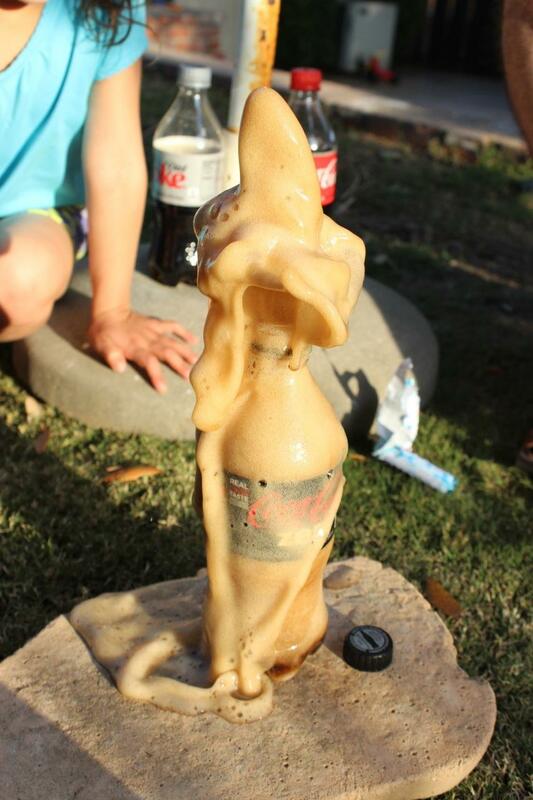 The geyser was very small, but the reaction kept going, making the bubbling last a lot longer than with the Coke-Mento blast. Without a doubt, the funniest things about the experiments of this day was the obsession with the smell… as well as at some point even trying its taste (yuck!!) We think next time we’ll make an experiment that addresses the sense of smell and taste, to cater to their curiosities. Maybe fizzy bath bombs? Or how smell and taste work together? We’ll see… Stay tuned! We love this experiment! My little guy did it when we were homeschooling…and then every time we went to the store after, I’d find Mentos in my cart for the longest time! LOL Love your pictures! Thanks, Donna! Taking the pictures was fun, and there are some really pretty ones of the foamy geysers! We’ll keep doing these science experiments and posting them, so keep visiting! How fun! Great photos too! Thanks, Ann! It was a lot of fun to do! Awesome! Let me know how it turns out! Definitely Coke Zero is the way to go, to get the maximum impact 🙂 Take some pictures and share!